The show will go on in Berkeley, according to far-right speaker Milo Yiannopoulos, who took to YouTube and Facebook Monday, accusing UC Berkeley of trying to sabotage Free Speech Week. It was Yiannopoulos who was on campus when violent protests broke out in February. He said the university didn't do enough to protect speakers and visitors, and his speech was canceled at the last minute. Now, Yiannopoulos and a newly formed conservative student group are accusing UC Berkeley of trying to silence them once again. In the YouTube video, Yiannopoulos and student journalists with the Berkeley Patriot say the university has not negotiated with them fairly, refusing to answer questions about refunding more than $65,000 in venue rental fees if they end up canceling. "This was designed to force a cancellation," Yiannopoulos says in the video. "We are not going to cancel Free Speech Week." The problem emerged Friday, according to the Berkeley Patriot's editor William Mike Wright. "Right now, the way the contract is ... that we're going to be forced to sign ... we're on the hook for that money," Wright said. 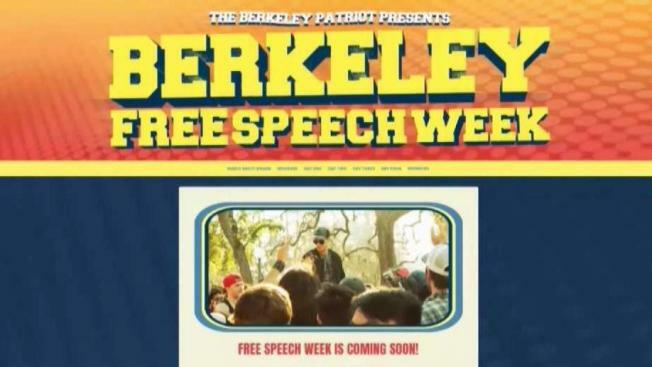 The Berkeley Patriot has been promoting a Free Speech Week for months, saying big names like Steve Bannon and Ann Coulter also will be making appearances. UC Berkeley said the event's organizers still have not provided confirmation from the speakers that they will appear, and university spokesman Dan Mogulof said they failed to meet critical deadlines over the past month to pay reservation fees on two large auditoriums. "If they wanted this venue so badly, why did they miss three deadlines, and why did payment finally show up on our doorstep, days, weeks after these deadlines had passed?" Mogulof said. Mogulof said the school answered all of the organizers' questions. The main disagreement was over the university's no-refund policy, something that he said is standard in every contract. "Those questions had been answered weeks earlier," Mogulof said. "They didn't like the answers." The Berkeley Patriot said it will hold a news conference Wednesday to update the list and schedule of speakers.